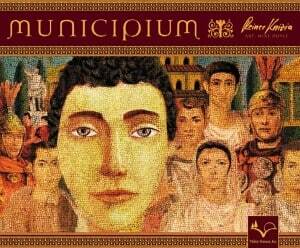 Reiner Knizia’s newest big box game, Municipium. This is classic Knizia at his finest! A prime mechanism of Roman expansion and control in the provinces (and in Italy during the conquest of the peninsula c. 500 – 265 BC) was the municipium (later the colonia), the premiere Roman provincial town. The game takes place in one of these municipalities. Players are each in control of a powerful family and try to strategically place their family members in the various institutions throughout the municipium and gain the support of the citizens; Scholars, Merchants, Soldiers, Priests and possibly even the Praefect. At various times in the game, if a player has the most influence in an institution, the player can exert the power of that institution and gain the support of certain citizens. Meanwhile, the preafect moves around the municipium and players strive to have the most influence in the institution that he visits, thereby earning his favour. There are seven institutions; Temple, Baths, Emporium, Praetorium, Tavern, Basilica and Forum, each of which have their unique powers with which players must decide how and when to use in an attempt to become the most influential family in the municipium. Complete artwork by Mike Doyle. This is a 3 – 5 player game with a playing time of approximately 40 – 70 minutes.